One of the best parts about living in the Bay of Quinte region is our location. We are located close to Toronto, Montreal, Upstate New York and Canada’s Capital Region and we have access to transportation options to take you to the rest of the country and around the world. Quinte is right on Highway 401, which stretches from Windsor to the Quebec border. The 401 provides our region with easy access to Toronto to the west and to connecting routes to Ottawa and Montreal to the east. We are located within two hours of Toronto’s Pearson International Airport by car. Ottawa and Montreal also have International airports and are within several hours. Quinte is serviced by VIA Rail - Canada’s cross-country passenger train service - through the brand new terminal in Belleville. Belleville and Quinte West are also serviced by Greyhound Canada, the largest provider of intercity bus transportation in Canada. 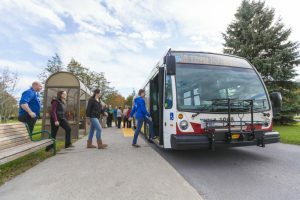 Belleville has a local bus service with several routes that run daily to carry passengers to local destinations including Loyalist College, the Quinte Mall and the Downtown bus terminal. There are also several bus services that take passengers to Belleville and Quinte West from the more rural areas of our community. Deseronto Transit provides transit service through Prince Edward County into Belleville with links to VIA Rail and Loyalist College.